As a career Psychologist Lucy is passionate about building on the human spirit. Interning at The Kenyatta National Hospital (Largest referral government funded hospital in Kenya and East and central Africa) she learned two things: First, the government cannot do it all and secondly, poverty kills people, not disease. As she advanced professionally, Lucy started to appreciate the need for systems in addressing mental health problems holistically. Dedicating herself to this passion she worked 11 years as the pioneer military Psychologist in the Kenyan ministry of state for defence. Lucy is an East Africa Acumen fellow and the founder of the True North Society, addressing mental health for soldiers and their families at a bigger scale. In 2015 she collaborated with IT and Tech professionals to design the diagnostic game app True North, which is available on Google and Windows play stores. Recently, she ran the first ever residential program for soldiers and their families. Some of her work has been featured via BBC and being leveraged to use the international platform to bring awareness, healing and care. True North also works with the government on trauma healing for families whose sons joined Al Shabab and the police. Lucy is a member of the Kenyan Psychological Association and chair of the innovations and events committees. Currently a PhD student, she just finished a yearlong Zafer Achi led Global leadership coaching. She is an alumnus of USIU-A 2002 and 2004. 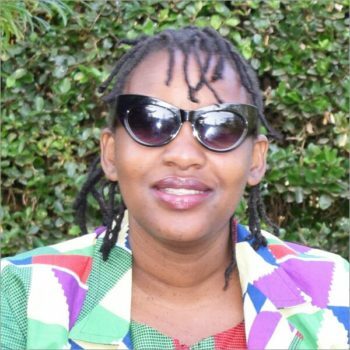 An author and writer, she has published one of the series of the children’s book Mutenyo and Friends. She was featured in 2016 among Kenya’s Top 40 women under 40 years. An avid cyclist and runner, she enjoys playing with children, knitting and cuddling rabbits and growing her own food. She is the mother of one.